I'm hoping that everyone had a wonderful Thanksgiving. Safe travels to and from wherever the holiday road leads you. I'm lucky to have family close by. Thank you to everyone who has been commenting on the blog and to those who have been especially supportive over the last month. It has meant a great deal--and I am thankful. I have managed to finish a hat for a friend--it was gifted about a week ago--and yesterday I noticed it already had a hole in it--compliments of the dog! I was smarter this time--much cheaper yarn (no wool) and a K2P2 ribbing all the way. 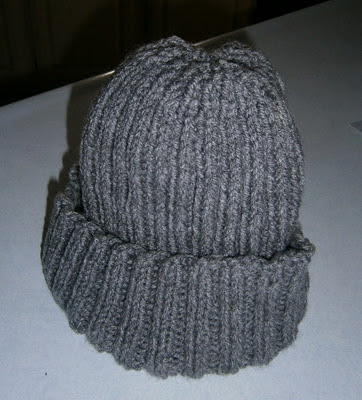 Pretty fast to knit and I didn't even cringe--okay, I really was expecting something dastardly to befall the hat. I am about 50 rows from finishing my neck down sweater. I was telling my mom that and she said, "So that makes you two, right?" I nearly fell down laughing--because it's still the first one! Oh, well. Thanks for stopping by. Enjoy every minute of this holiday weekend. Callie was feeling a bit neglected because she hadn't been on the blog in quite some time. 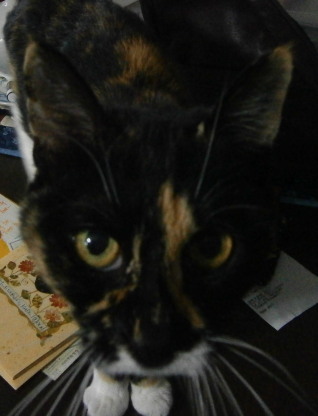 Needless to say, she's got her eyes on you! Cold, rainy weather. But Thanksgiving is coming and then the mad rush to Christmas. Thanksgiving seems to get pushed further and further to the background every year. I swear they started playing Christmas carols in the malls right after (if not before) Halloween. I was going to try to get some errands done before Thursday, but who knew that Black Friday would last all of Thanksgiving week? Gotta run for now. It's late and I am trying to get a few on-line things done...like the blog! More Finishes and a Surprise Sighting! 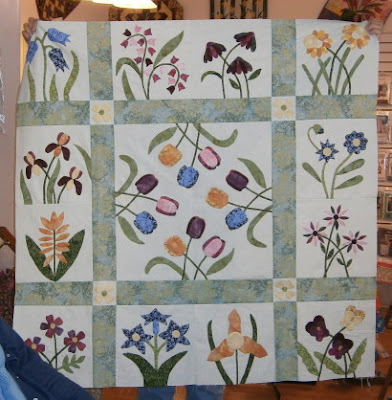 Margaret of Trumansburg, New York, brought her finished Flower Garden Applique quilt to the hand quilting class on Saturday. Isn't it lovely? Unfortunately, the colors are not very true in the pic--it's a beautiful green on green background with vibrant flower fabrics. Margaret is a very enthusiastic student, to say the least! Great job! A true finish--no kidding! 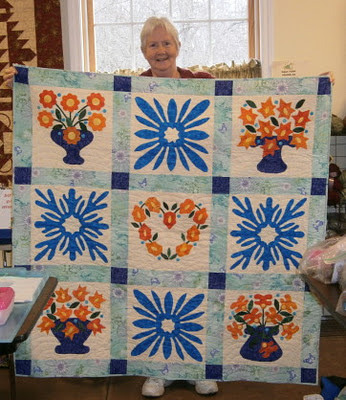 Sharon G. of Skaneateles, New York, not only had her top finished, but it was quilted and bound! Now that's finished! This is from my In Baltimore Style Block of the Month. Here's a detail. The sashing was perfect for this colorful quilt. Doesn't it make you think of the Caribbean? And the surprise sighting? 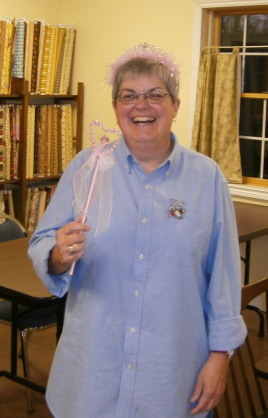 It was me, with my new tiara and wand! Thanks to Susan M. for suggesting the photo! I had just received not just one but two beautiful tiaras and matching wands. Several of the shop's staff thought it was my birthday! Truly, one should wear tiaras whenever the mood strikes--it's good for the soul! 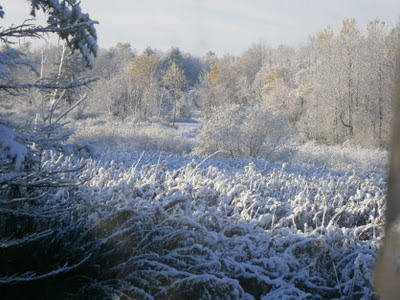 We've been blessed with snow yet again. And then it's supposed to be in the mid-50s tomorrow! Go figure! P.S. Books I've listened to: The Red Queen by Philippa Gregory; Horse Heaven by Jane Smiley. I finished the series on foxhunting by Rita Mae Brown and am still reading Animals in Translation. I'm hoping to catch up a bit here and then be able to move forward with the next post. First up, another Flower Garden finish! 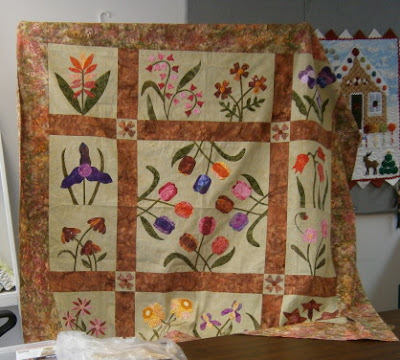 Bettina, who managed to hide herself behind her beautiful quilt, did a superb job with this. 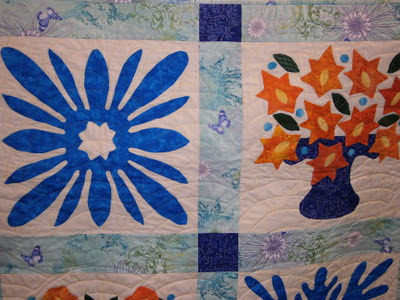 Her plans are to hand quilt it, as she does all her quilts. And she does finish in a timely manner. Ahhhh, to be more like Bettina! 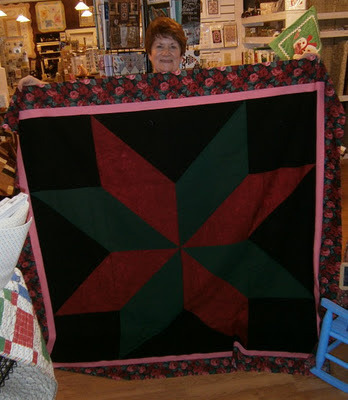 And Wilma brought in her finished Triangulated Star top! Two lovely borders are the perfect finish to this colorful top. 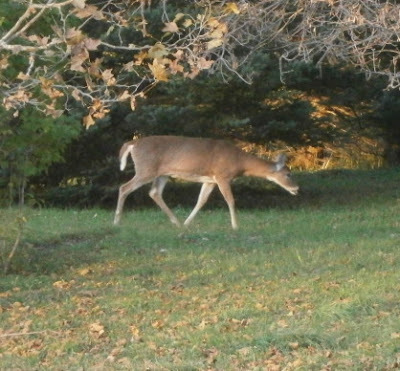 Deer have been making regular pilgrimages through the yard. This one is only about 20 feet from the front porch! 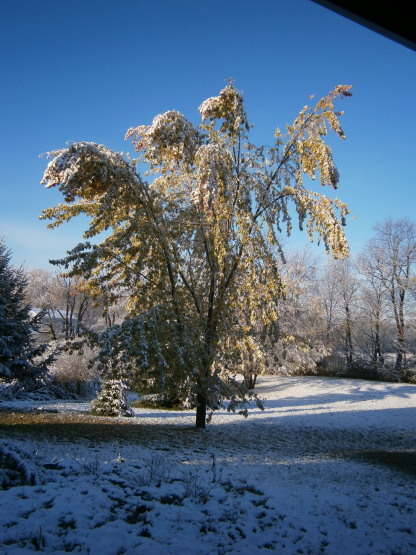 Much too early for this much snow--plus the leaves were still on the trees. Luckily no damage to anything major. Still...a rude awakening to what's coming. P.S. I have listened to Sleeping Doll and its sequel Roadside Crosses, both by Jeffery Deaver. I am reading Hounded to Death by Rita Mae Brown (the last in the series so far) and Animals in Translation by Temple Grandin (non-fiction). 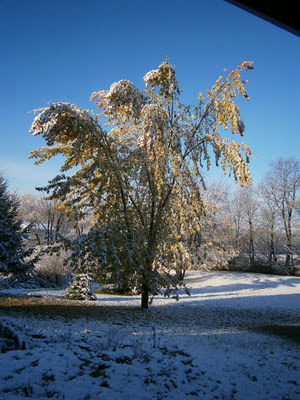 You may also want to check out Stacy Westfall's blog: www.stacywestfallhorseblog.com. Yes, it is about horses, but also has some interesting insights about other things. It's a good read, with videos you can watch...or not.